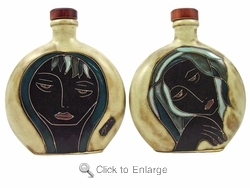 This Mara Stoneware 20oz Decanter - Woman/Hand is artfully done with a pair of hands holding a face on one side of the decanter and another face on the other side of the decanter. This goes with Mara's unique Stoneware Dinnerware Set - Green-Faces. You can see all Face Designs mugs and more here Face Designs. Approximate dimensions (l x w x h): 6.5" x 2" x 8.25"